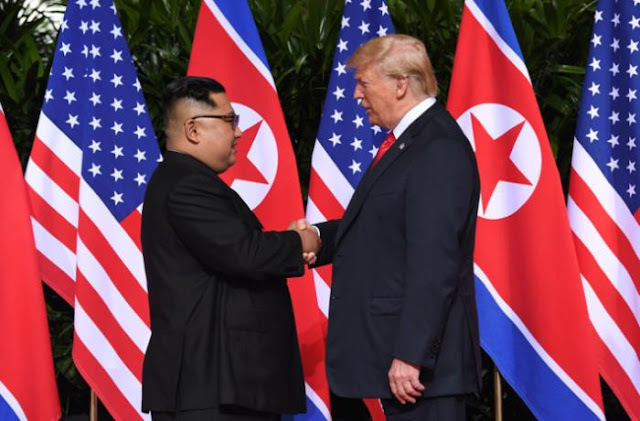 Singapore - AsiaNews Release - US President Donald Trump and North Korean leader Kim Jong-un have signed a "historic" agreement in front of the entire world. Before gathered journalists, Kim added that "the world will see change" and Trump emphasized the same thing, adding: "Thank you. This is fantastic". Trump and Kim had shaken hands this morning at 9 am (local time), opening up new possibilities for peace on the Korean peninsula. It is the first time meeting between a US president and North Korean leader in 65 years, since the end of the Korean War. The two leaders, who over the past year traded heavy accusations and threats of mutual destruction, met at the Capella Hotel on the island of Sentosa, exchanging words of welcome. In front of a row of flags from their two countries, shaking hands, Kim said: "It's nice to meet you, Mr. President." Trump added: " We're going to have a great discussion, and I think tremendous success. And it's my honor, and we will have a terrific relationship, I have no doubt." The content of the signed agreement is not yet known. It is assumed they have found a common line for denuclearization of the Korean peninsula and for supporting the stability and economy of North Korea. Both, talking to journalists, said they wanted to put aside "the past". After the greeting, the two had a 45 minute conversation alone and then gathered together with the related staff to sign the agreement. South Korean President Moon Jae-in expressed hope for a positive outcome from the talks. The Korean Church has accompanied the preparation and the meeting with a prayer novena. The Catholic Church in Korea has proposed a novena from 17 to 25 June to pray for peace, reconciliation and unity on the Korean peninsula. As leaders of the United States and North Korea held an historic Summit in Singapore on June 12, the Korean Church called for a novena of prayer and organized a conference for reconciliation and unity between the two Koreas – who technically – are still at war since the Korean Armistice Agreement signed in 1953. In the 27 April Panmunjom Agreement, the two leaders committed to bring a swift end to the Cold War relic of longstanding division and confrontation, to boldly approach a new era of national reconciliation, peace and prosperity, and to improve and cultivate inter-Korean relations in a more active manner. The Catholic Bishops of Korea have indicated a different prayer intention for each day: For healing following the separation of the Korean people; for families who have been separated by the Korean war; for the brothers and sisters who live in the North; for refugees from the North who currently live in the South; for politicians of the North and the South; for the evangelization of the North; for the promotion of exchange and dialogue between South and North; for true reconciliation between the two nations; for the peaceful reunification of the peninsula. A Conference on the future of the Korean peninsula The Bishops are also promoting a Conference on 21 June to take place at the Major Seminary of the Archdiocese of Daegu. Dedicated to a new future of the Korean peninsula thanks to fruitful exchanges between South and North, the event foresees the participation of the Bishops of Uijeongbu and Daegu as well as a panel of experts.